Each year after the Tribeca Film Festival in New York City, the showrunners release a handful of the films that have premiered there on a variety of streaming outlets. It’s unclear how they decide which films to release, but after watching writer/director Frédéric Jardin’s “Sleepless Night”, they must be the best of the fest. 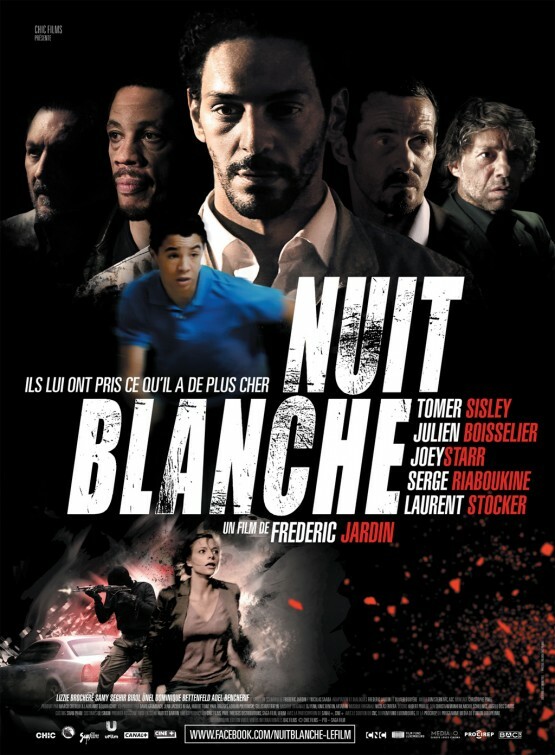 This French thriller is clearly one of the most intense nail-biters I have seen in some time. I can’t remember the last time I’ve been pulled into a film cold turkey, knowing next to nothing about the filmmakers or the actors involved, and became immediately transfixed and committed to the story, the characters and the non-stop action. It’s similar in many ways to a movie like “Taken” but more manic, since the protagonist is more frantic and desperate to see things through. If you’ve been searching for a coherent and awesome action movie, look no further than this relentless nocturnal ride. Jardin starts out with a visually absorbing title sequence that feels like the opening of “Kiss Me Deadly”, so right there – I’m hooked. From there, we dive into a daring daytime heist and watch as two men in ski masks, Vincent (Tomer Sisley) and Manuel (Laurent Stoker), collide into a car and steal a load of cocaine from the occupants. It doesn’t go all that smoothly though, when an altercation leaves Vincent with an annoying stab wound. We follow him to his work and learn the guy’s a cop. So, the first catch is that Vincent is corrupt and so is his partner, Manuel. 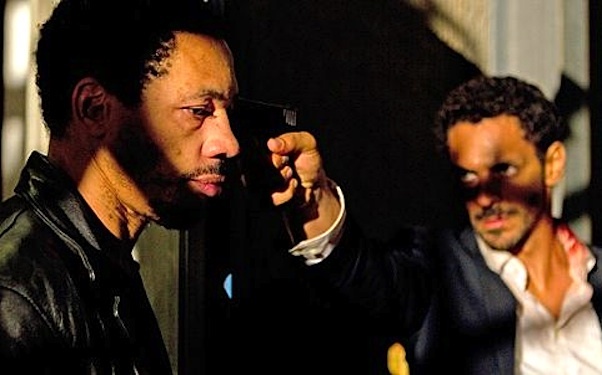 We soon learn that Vincent has had some secretive dealings with the owner of the procured package, a local kingpin named Marciano (Serge Riaboukine) who doesn’t take kindly to his product being stolen from him – especially when he learns who stole it. To get his goods back, Marciano kidnaps Vincent’s adolescent son from school and holds him hostage and a massive nightclub he owns. All Vincent has to do is show up at the club, return the coke to Marciano and leave safely with his son. Fair and simple transaction. But nothing is simple in “Sleepless Night” (hence the title), especially when other parties interfere with the transaction for various reasons. First off, Manuel isn’t too happy with what his partner is doing with the drugs, but his objection is the last thing on Vincent’s mind. As soon as Vincent arrives at the club, he stashes the bag in a ceiling above a toilet in the men’s room, before he makes his way to Marciano. He’s unaware he’s being tailed by a female cop, Vignali (Lizzie Brocheré) who’s out to bring Vincent to justice, while her own boss, Lacombe (Julien Boisselier) an Internal Affairs cop has his own agenda. We also see some of Marciano’s clients (led by French rapper, Joey Starr) get involved in the evenings affairs. All parties are determined, dangerous and willing to do anything to meet their respective goals. Everything falls apart when Vignali moves the bag, which puts Vincent in quite a predicament with Marciano, who won’t release his boy unless he gets what his. What becomes apparent here is how compelling the characters in “Sleepless Night” are, but also how exciting the screenplay (co-written by Jardin, along Nicolas Saada and Olivier Douyère) is with its added stakes, painful twists and unexpected turns. At no point did I ever truly think I knew how the story was going to play out – and that’s quite refreshing. Jardin excels at making every frame matter and for a film with a story that has a kinetic pulse to its emotional urgency, that’s important. In such congested locations, it would be easy to lose ourselves in all the hallways, cramped stairwells, bustling kitchen, and privates offices, but Jardin takes us by the hand and runs us through it all, while managing to make everything we see count for something. If we see Vincent stash a gun, it will play out later in an interesting (not predictable) way. If Jardin has us run into characters more than once, it’s either to add levity or escalate the threat. Its assured and purposeful filmmaking. From start to finish, Jardin matches the pulse-pounding psyche of the protagonist with energized visuals. Whether it’s a bloody no-holds barred fight scene in the kitchen between Vincent and Lacombe or an unnerving less-than-admirable confrontation between Vincent and Vingali in a freezer, the gripping scenes always feel real and raw. It helps that Jardin’s direction is aided by a contagious score by Nicholas Errera, but the guy who sells it all is Sisley. He has to, but it’s not always easy rooting for a morally ambiguous character. Still, the hook is we want him to survive so his likable son will be safe. One would never guess that Sisley (also quite good in “The Heir Apparent: Largo Winch”) has roots in comedy, but then again, we see how he effortlessly portrays Vincent’s gift for improvisation quite well. Easily solid leading-man material, Sisley knows the role affords little time to stop for any award-worthy monologues, yet when Vincent does stop to catch his breath or tend to his wounds, he delivers an exhausted, panicked man. A man who’s willing to do anything and harm anyone to get to his son. In a night where nothing seems to go right, Vincent’s resilience is something to behold, and as the hours increase viewers feel more and more just as wasted as he is. Each year, it’s a rare thing to find a movie that captivates and surprises and has you instantly wanting to re-watch it. In fact, that’s exactly what I did. Both Jardin and Sisley have been firmly positioned on my moviegoing radar. I imagine I’ll be following them with the same enthusiasm as I do Wending Refn and Fassbender. 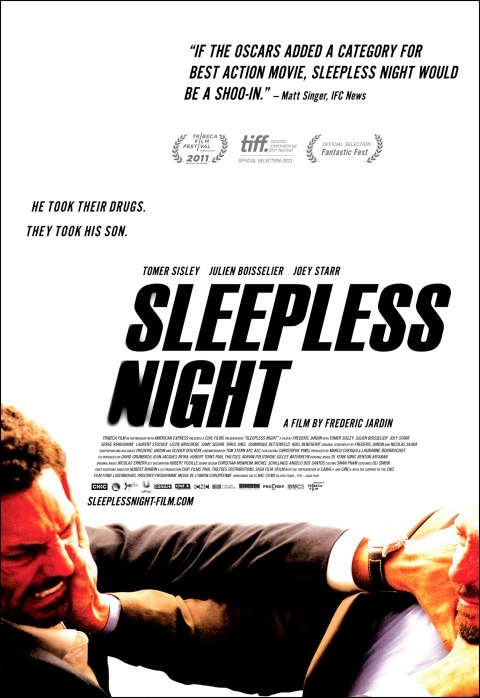 With its succinct choreography and inventive use of geography, accentuating it’s great cast and story, “Sleepless Night” will go down as the most recommended film of 2012 for me. As far as action movies go, it’s right up there with “Die Hard”. My goal is turn everyone on to it. Inevitably, Hollywood will likely get its hands on “Sleepless Night” and remake it with Denzel Washington, Russell Crowe or Colin Ferrell in the lead role. Expect it in a few years. See?